Filipino bantamweight Mario Fernandez avenged his loss to India’s Shiva Thapa in the 2013 AIBA World Boxing Championships by scoring an impressive unanimous decision to enter the semi finals of the Incheon Asian Games boxing competition which assured him, like lightweight Charly Suarez, of at least a bronze medal. Fernandez boxed intelligently against his former conqueror using his hand-speed and movement to good effect and darting in and out to connect with solid combinations and often catching Thapa with vicious counter left hooks. A product of the grassroots development program of the Amateur Boxing Alliance of the Philippines under its president Ricky Vargas and chairman Manny Pangilinan, showed his potential earlier in the tournament by reasserting his superiority over fancied Thai Doncha Thathai whom he beat in the finals of the Southeast Asian Games and then frustrated Nepal’s Puran Rai to score a 30-27 shutout to enter the quarter finals. With the coaching staff of Nolito “Boy” and Roel Velasco along with Romeo Bring giving him precise instructions which he followed to the letter, Fernandez made his task against Thapa much easier often resulting in the young Indian boxer lunging desperately and getting tagged with perfect counter punches. Thapa had advanced to his showdown with Fernandez the easy way. He received a walkover in his opening bout from Timor Leste’s boxer and was adjudged winner over Nadir of Pakistan by technical knockout after the Pakistan boxer was cut over his right eye and the ringside doctor ruled he was unfit to continue after one minute and five seconds of the opening round. The short exposure of Thapa in the ring contrasted with the competitive fights of Fernandez who as a result was sharp and ready. The 21 year old Fernandez won by a 30-27 shutout on the scorecards of two judges while the third had him ahead 29-28. He will meet China’s Zhang Jiawei who scored a controversial split decision over Nyambar Tugstsogt of Mongolia which was roundly booed by the fans. In the evening session today, light flyweight Mark Anthony Barriga and middleweight Wilfredo Lopez will strive to duplicate the feat of Fernandez in the first session when they battle truly tough opponents. Barriga faces Hasanboy Dusmatov of Uzbekistan, silver medalist in the 2014 Kazakhstan President’s Cup while Lopez clashes with Shinabayar Naramandakh who overpowered Almutauru Zaid of Kuwait with 49 seconds remaining in the second round of his last bout which was stopped due to a nasty cut under Narmandakh’s right eyebrow which the coaching staff has instructed Lopez to target. 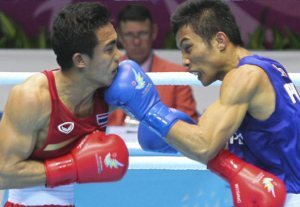 Photo: The Philippines' Mario Fernandez (R) connects to the chin of Thailand's Doncha Thathai in the Incheon Asian Games action. Photo courtesy of Pattarapong Chatpattarasill.